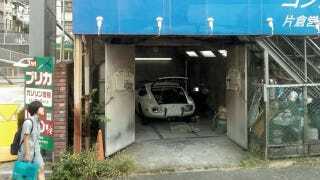 What you see here is a Toyota 2000GT getting fixed up in a Japanese shed. The image was taken from a bus between Yokohoma and Haneda Airport and sent to Cink, Gawker Media's Hungarian-language news a gossip blog. Chassis number MF10-10073 looked like this in 1992, and is sure worth a hell of a lot more today. While the garage might not look fancy enough for such a rare classic, a massive billboard above depicting the car is proof that they know what they're dealing with. The place was full of cool modern Japanese and foreign sports cars, while this shed was at the back with this single car, getting fixed by a Japanese guy wearing the full protective set, including a hat with a neck shade. Give me this and an LFA, than leave me alone.